Crash scene. Photo by Kris Kream. Around 6:40 p.m. on Wood Avenue at Mariposa St. The fatal-accident reconstruction and homicide units were called in, just in case. Julio Salado almost had to take this picture of a motorcycle rider and a dog riding shotgun because otherwise, nobody would believe him. Stevil photographed some of the bikes at the Northeast Motorcycle Expo at the World Trade Center over the weekend. Around 2:45 p.m. at Mass. Ave., Nichole Davis reports. The road is now shut at Kenmore. 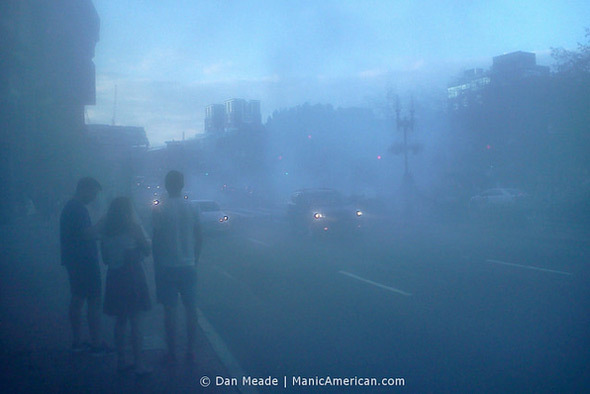 The Globe reports on a crash around 1:15 a.m. at Mass. Ave. and Haviland Street. State Police are investigation a collision at the West Roxbury/Dedham line around 7:15 p.m. that left a motorcyclist pinned under a pickup truck before he was extricated and transported to Beth Israel Hospital with life-threatening injuries. Stephen Walsh, who took this photo of the motorcycle, reports the motorcyclist has died.